Biotinylated Human ANGPTL7, Mouse IgG2a Fc Tag, Avi Tag (AN7-H82F3) is expressed from human 293 cells (HEK293). It contains AA Gln 27 - Pro 346 (Accession # O43827-1). This protein carries a mouse IgG2a Fc tag at the C-terminus, followed by an Avi tag (Avitag™). The protein has a calculated MW of 65.8 kDa. The protein migrates as 66 kDa and 75-95 kDa under reducing (R) condition (SDS-PAGE) due to glycosylation. 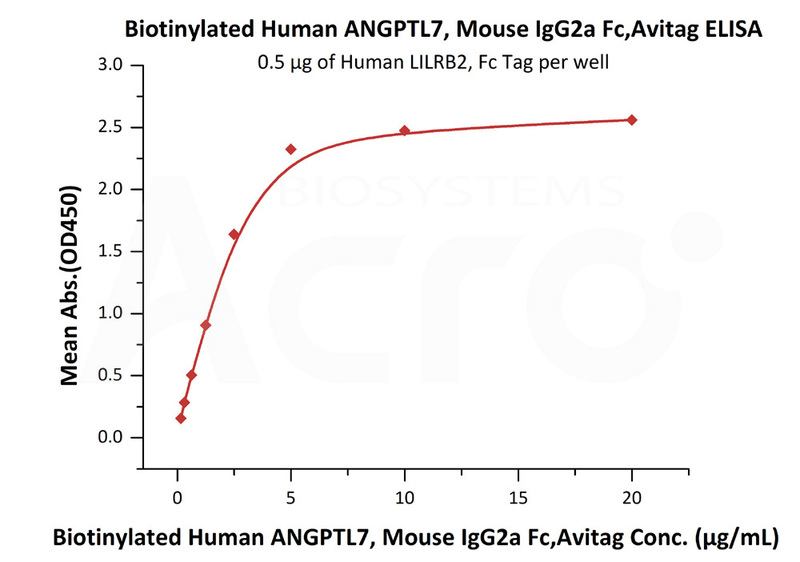 Biotinylated Human ANGPTL7, Mouse IgG2a Fc Tag, Avi Tag on SDS-PAGE under reducing (R) condition. The gel was stained overnight with Coomassie Blue. The purity of the protein is greater than 90%. Immobilized Human LILRB2, Fc Tag (Cat. No. 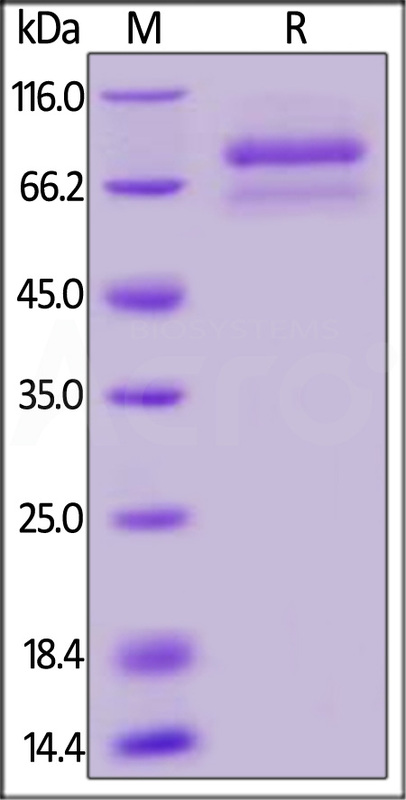 CDD-H5259) at 5 μg/mL (100 μL/well) can bind Biotinylated Human ANGPTL7, Mouse IgG2a Fc Tag, Avi Tag (Cat. No. AN7-H82F3) with a linear range of 0.156-2.5 μg/mL (QC tested). Angiopoietin-like 7 (ANGPTL7) is also known as Corneal-Derived Transcript 6 (CDT6), and is a secreted glycoprotein that is structurally related to the angiopoietins. It is expressed in the corneal stroma, trabecular meshwork, and sclera and is elevated in glaucoma aqueous humor. Recently, ANGPTL proteins, including ANGPTL-2, -3, -4, -5 and -7, are identified as growth factors in combination with SCF, Thrombopoietin, IGF-II and FGF acidic that enhance the expansion and engraftment of human and mouse hematopoietic stem cells. (1) Peek R., et al., 1998, Invest. Opthalmol. Visual Sci. 39 (10): 1782-1788. (2) Peek R., et al., 2002, J. Biol. Chem. 277 (1): 686-693. (3) Kuchtey, J. et al., 2008, Invest. Opthalmol. Visual Sci. 49 (8): 3438-3448.